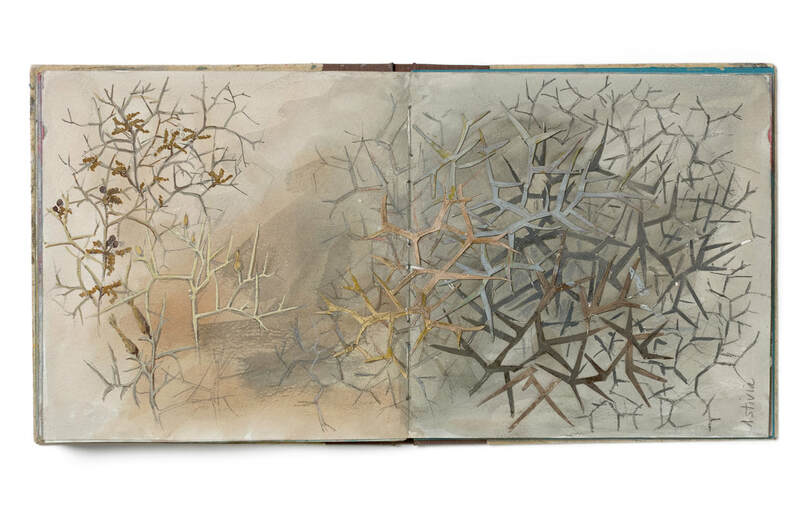 Sketchbook Explorations by Shelley Rhodes is published by Batsford. Photographs by Michael Wicks. Sketchbooks can prove a contentious subject. There are those that do, those that don’t and those that dabble. 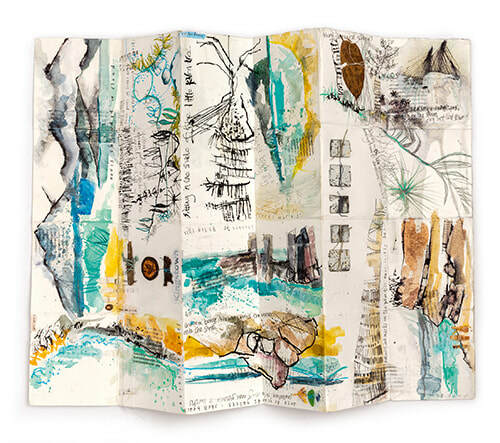 Shelley Rhodes is definitely in the ‘those that do’ camp and she keeps such beautiful sketchbooks that you will find yourself coveting such prize specimens. Shelley Rhodes trained as a graphic designer. There’s a brief reference to it near the end of the book but this news brings everything into perspective. The clarity and purpose behind her explorations draw from the discipline of graphic design but run alongside the freedom of her artistic expression. It is these two elements coming together that creates such a beautiful selection of work. 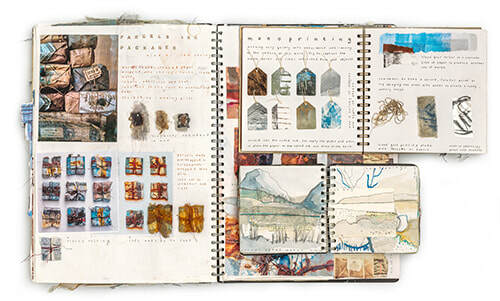 ​The books incorporate drawing, colour, mixed-media, found objects, collections and photographs. 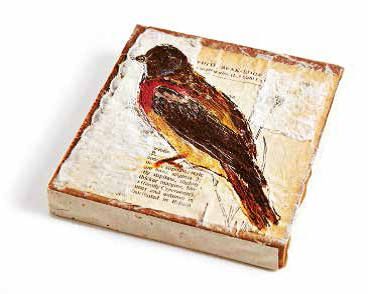 They cover themes such as coastal and urban decay, holiday memories, or mark-making. The essence of each book is to find its purpose and run with it. So, the visual diaries of holidays become an artistic expression of the experience of place, may use found objects from that place to make marks or keep as a memento. 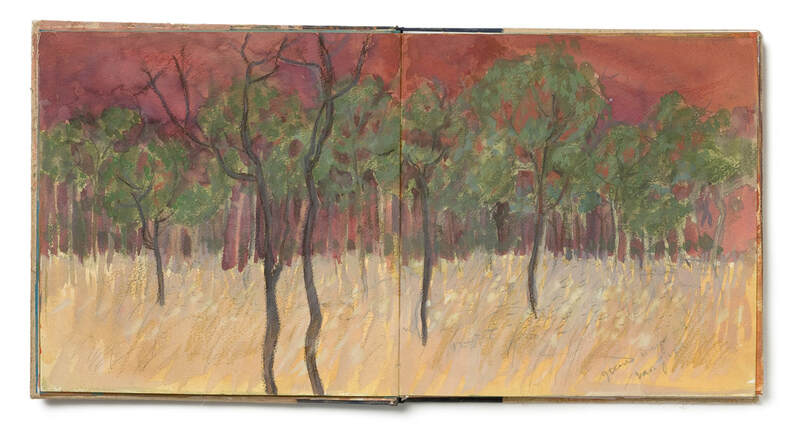 Observations of the surroundings may be noted, colours or plants added or more abstract impressions sketched and painted. 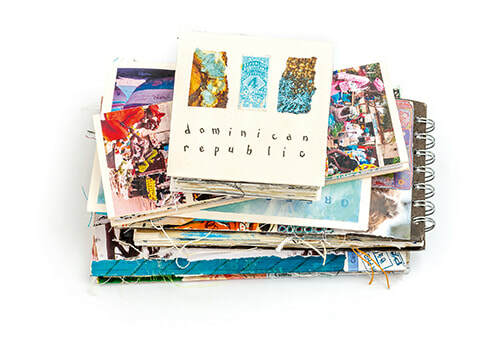 Found objects are not kept hidden away but arranged in collections or boxes, rearranged or stuck directly into the sketchbook pages (spiralbound books come in handy here for bulky pages). ​A range of different sketchbook types are demonstrated – bought books, made books, tag books or index cards that make up reference libraries, scrolls, fabric pages, and extra long ‘walk’ sketchbook pages. There are numerous ideas presented and you will see the world open up before you as the options available are laid out. There are also suggestions of how to add content to your books with mark-making, sketching exercises, writing, making tools, altering pages. So much that you cannot help but be inspired. Shelley Rhodes’s work itself is awe-inspiring but she also has carefully chosen other fascinating artists to feature and share their work practices. 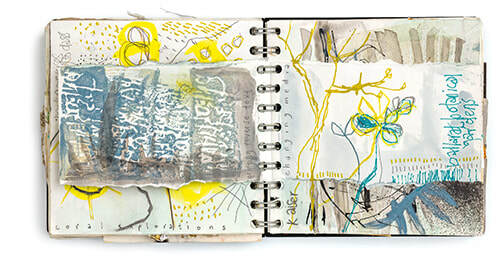 This makes the book something of a powerhouse of sketchbook demonstrations with the addition of Debbie Lyddon, Helen Terry and Diana Harrison, particularly in the area of mark-making. For visual diaries and work development, Jean Draper, Gwen Hedley, Ines Seidel and Jan Miller all produce work that is exquisite as work in progress and clearly show how work evolves from what is often a simple idea. What impresses most about this book is the attention to detail and clarity of the work, the way the author and all artists compose their sketchbooks and are so attuned to their practice. The approach is intuitive but ordered with a clear purpose. Shelley Rhodes, amongst all the wonderful art and books, also reminds us that the sketchbooks can also be a private matter. We can choose what to show the world. This gives the reader the security to know that the sketchbook is allowed to be the place to make mistakes that no-one needs to know about. Artistic practice can be worked and perfected until you find your own way but if you need help in clearing the first hurdle, I cannot think of a better book to recommend. 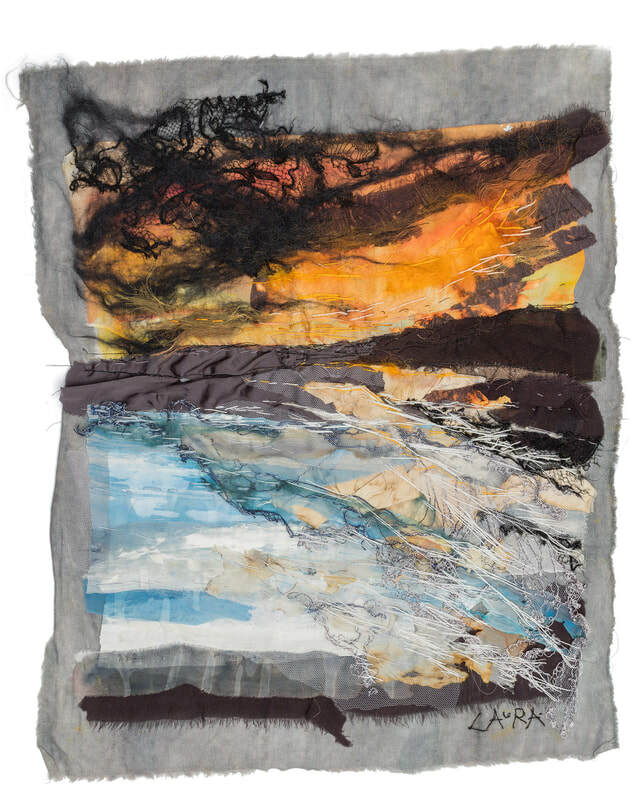 ​Cas explores how the notion of a traditional art subject, the landscape, is adapted for interpretation by textile artists. Cas has a strong affinity with nature. 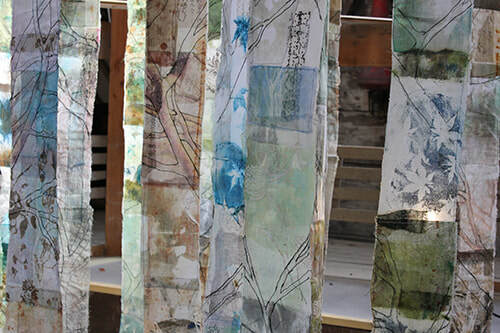 Her work in pieces such as 40 Yards, which was inspired by finding a piece of cloth with ’40 Yards’ printed on it and led to a series of work that mapped that area outside her home, and the Tree Lines studies which traced a path between Gillingham and Eccles, all draw on Cas’s experiences of the natural world. She works with the charity Plantlife and her Tea Flora Tales work was created to raise awareness of the work that they do. Textile Landscape therefore is a much richer book as a result of the deep love of nature and preserving our wildlife that Cas has. There are tutorials and exercises on how to screenprint, keep a sketchbook, create a simple stitchscape and creating a rolled/folded journal but these are the tools for working in the way that Cas does. What is fundamental to the book is the way that Cas and the other artists assimilate their landscapes and interpret that into their art through paint and stitch. This becomes the heart of the book and it is communicated in a beautifully poetic way. 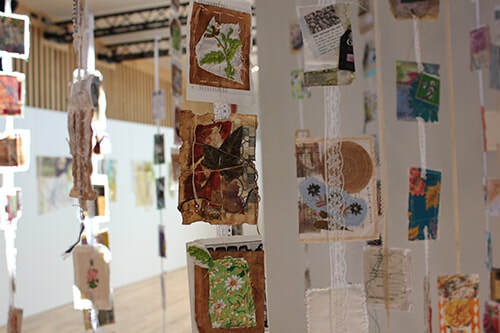 Cas talks about how we all build connections with our environment but the more you can translate those feelings in visual terms, the more you can express your sensibilities of place through textile art as “The transformation of ordinary fragments into extraordinary forms”. You can capture moments before they change with light, weather or the seasons or find objects that evoke a strong memory. 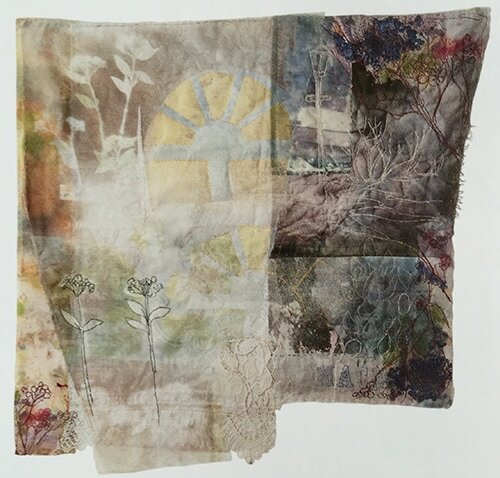 The beauty of working in textiles and mixed media means that found objects, real plants, photographs and fabric can all be incorporated into pieces and will create new layers of meaning. Coupled with Cas coaching the reader into taking time to record both the physical observations and emotional reactions to where you are will create a truly personal response. By being tutored in the processes of recording information and translating that into stitch, the book leaves the reader yearning to explore their own connections to nature and how to communicate those emotions into a physical representation (not necessarily a reconstruction). It opens your eyes to the possibilities of artistic expression and invites you to explore how you respond to a landscape. I love the way that Cas’s work layers the physical fabric, paper, found objects and text with the reactions, memories and emotions and all these are held together with stitch. 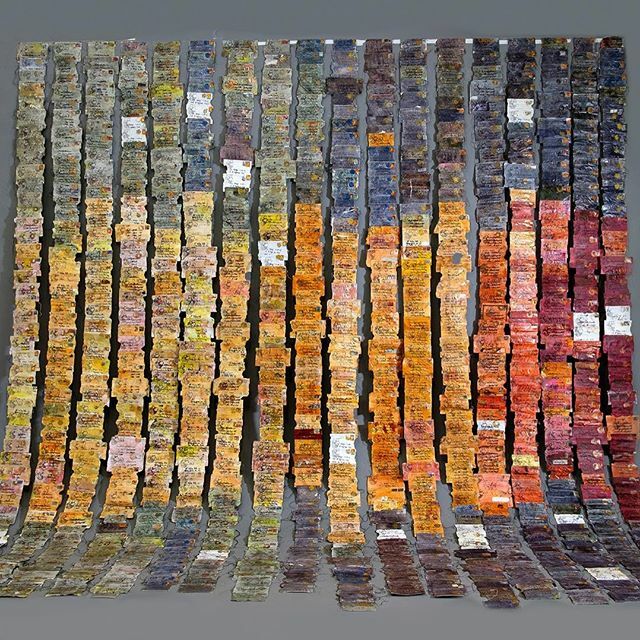 Textile Landscape is a complex, thought-provoking and multi-layered response to time and place as seen through the artist’s eyes but teaches us all how to look deeper in order to frame our own artistic vision. 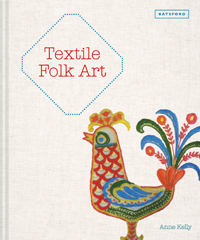 Anne Kelly’s latest book Textile Folk Art takes a look at Folk Art from around the world and explores how works that are rooted in identity, childhood, family and community can shape the contemporary folk textiles of today. Acting as a practical and inspirational guide, we are set on path of discovery around the world with the author as our guide. Anne has gathered, assembled and curated a story of thoughts, feelings and memories of times past and present, people working then and now and intertwines it with her own work. The book is introduced by a photograph of her (Jewish) Grandmother as a child wearing traditional German dress and we learn of her family’s movement between countries as refugees. These and Anne’s own experiences of growing up in Canada, doing her first degree there and now living in the UK, a self-described immigrant in her adopted country, are strong influences that surface throughout the book. Her project Moving Memories (picture below) focuses in on this theme, as do her pieces Sophia Bianca and Zulema Alma. The reader has the opportunity to learn from the knowledge and objects that Anne has found along the way. Given her interest in travel, the Folk Art Tradition and her use of vintage and donated items, throughout the book you see how these experiences and interests have shaped the artist’s work. The subject matter in the book is divided into five major sections – Samplers, the Nordic influence, Travel and Memory, Small Worlds and Home and Childhood. They mingle the traditional with the contemporary with the choice of historical pieces chosen that sit alongside contemporary artists working today in a style that echoes the past. These artists range from established figures Jessie Chorley, Hannah Lamb, Mandy Pattullo to emerging artists such as Ellie Macdonald, Laura Marriott and Bella May Leonard. 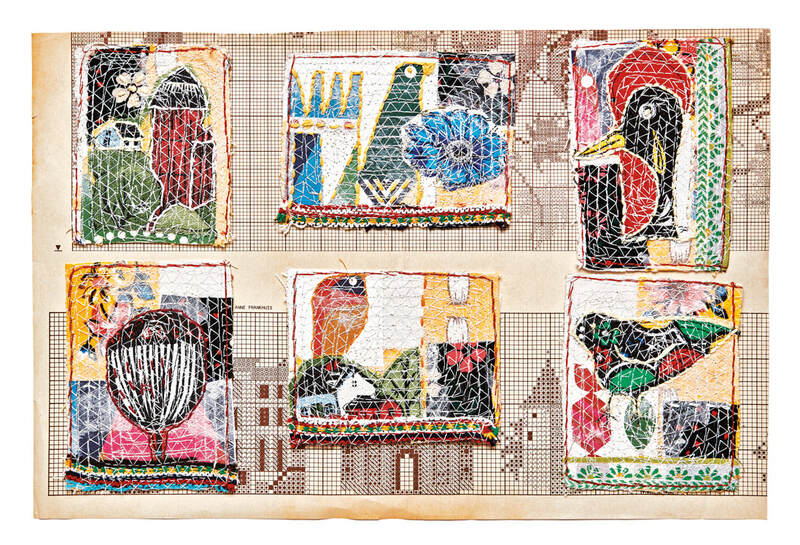 The choices are inspired, whether the thought-provoking Travelling Blanket work of Dijanne Cevaal, whose embroidery records travel without writing, to Nancy Nicholson’s beautiful patterned designs which reference Folk Art motifs and her mother’s designs from the 1960s. Each artist’s work is chosen to perfectly reflect the past and communicate the present to the observer. 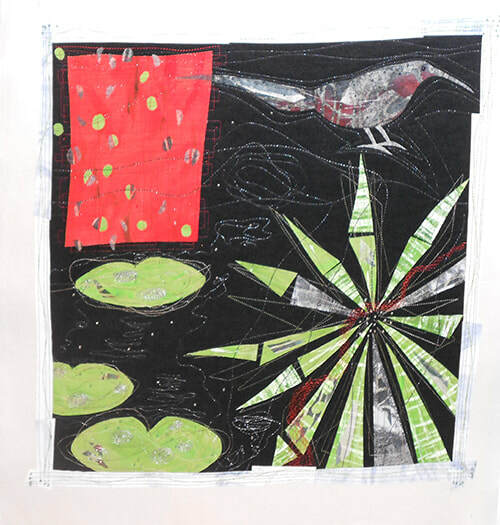 Small Folk Collages by Anne Kelly; mixed-media collages, fabric and paper on cloth. 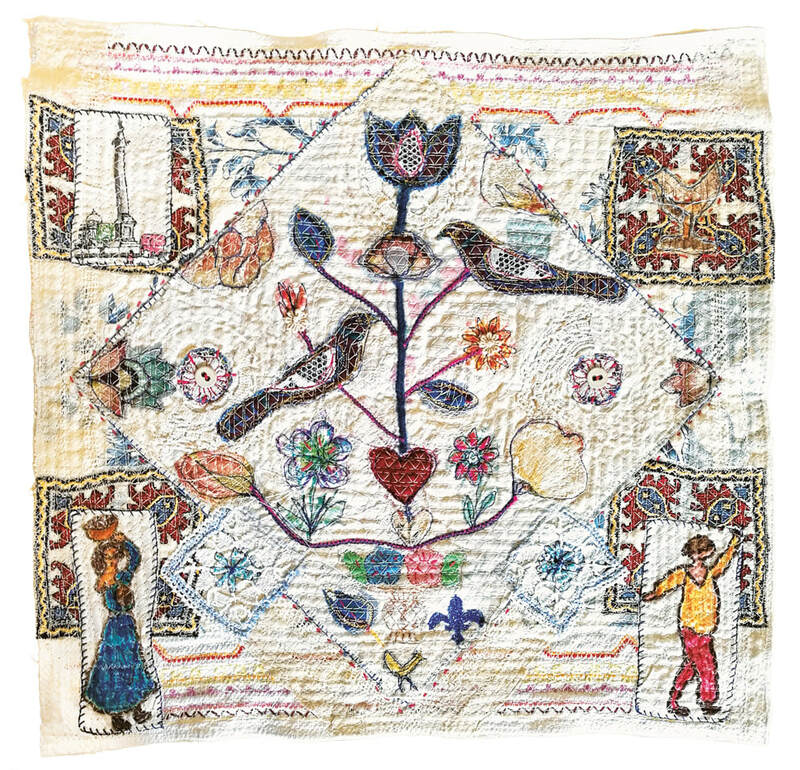 ​On Anne Kelly’s travels, whether from the traditional stitched samplers from the 18th Century, embroidery developed in yurts in Inner Mongolia or the creation and decoration of khadi cotton in West Bengal, we are invited to share in her discoveries and understand how a world history of Folk Art is embedded in her own work. This is what really shines through in the book. Pieces from her collection range from typography (leaflets, buttons and books), vintage haberdashery items, pincushions, Indian playing cards, samples of fabrics and embroidery, postcards and animals from all corners of the globe. Just seeing these items collected together in the pages require extra attention as close inspection reveals a wealth of covetable treasures. ​We also get to see the process of work that Anne’s work involves with a number of progress images from when the pieces are composed to their finished state, after they are machine embroidered with Anne’s signature stitch. The stitching brings all the layers together and binds them in a protective layer, distressing the surface whilst unifying the work. A sense of identity for each piece comes from the connection of motifs signifying identity, place and possession through stitch. 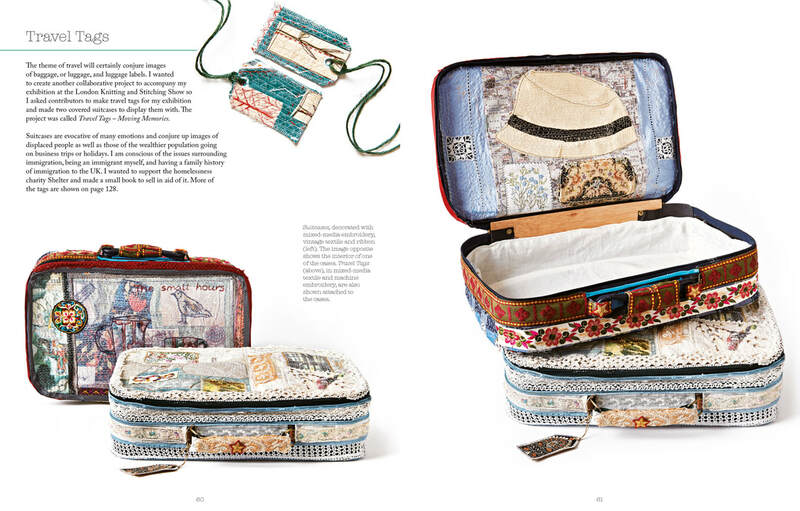 It is a lovely way of understanding Anne Kelly’s approach to her own interpretation of Folk Art. ​By sharing her journeys into Folk Art history, you get a glimpse of the richness created by curiosity. 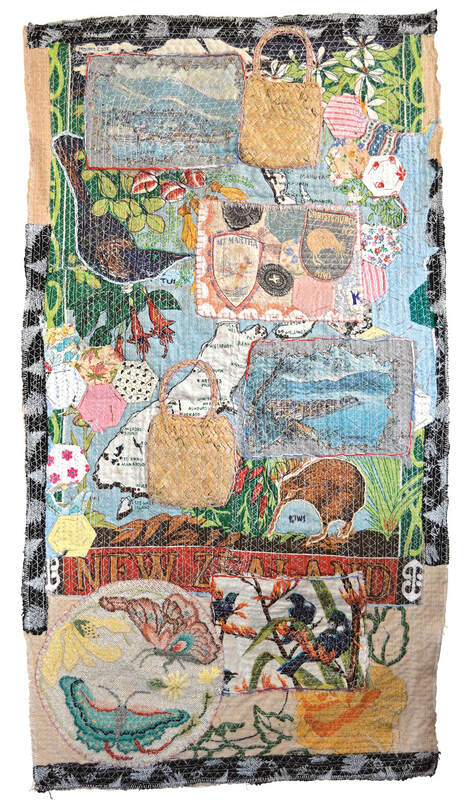 It translates into textiles and embroidery and leaves the reader contemplating how many layers of learning, history and travel can be connected through stitch. 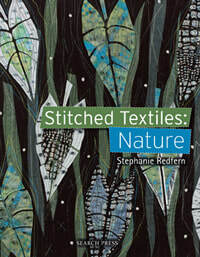 If you have enjoyed this review, please see my review for Textile Nature (reproduced with kind permission from Workshop on the Web) and photo galleries from the launch and exhibitions of this book. Please click on the photos below. 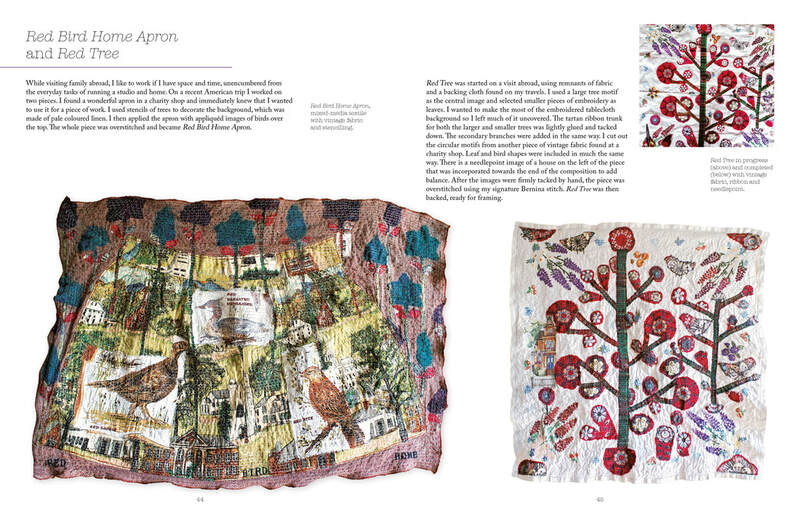 Jean Draper’s new book, following on from Stitch and Structure (published by Batsford in 2013) focuses on using pattern in textile art. 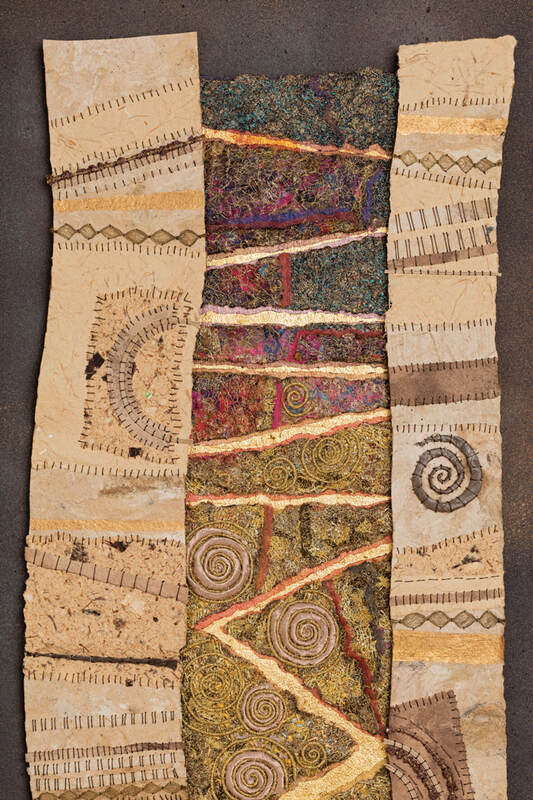 Jean looks at the origins of patterns that appeal to us, how these can be interpreted in stitch and studies how these patterns have been interpreted around the world in different cultures. It is an intelligent book that draws on art, science and mathematics and blends them together in the matter of pattern making. The premise of the book is that mankind is drawn to patterns to make sense of the chaos in the world. By finding a means of ordering the natural world around us, we can find stability and surety. And by finding a pattern, we can use it for artistic expression. 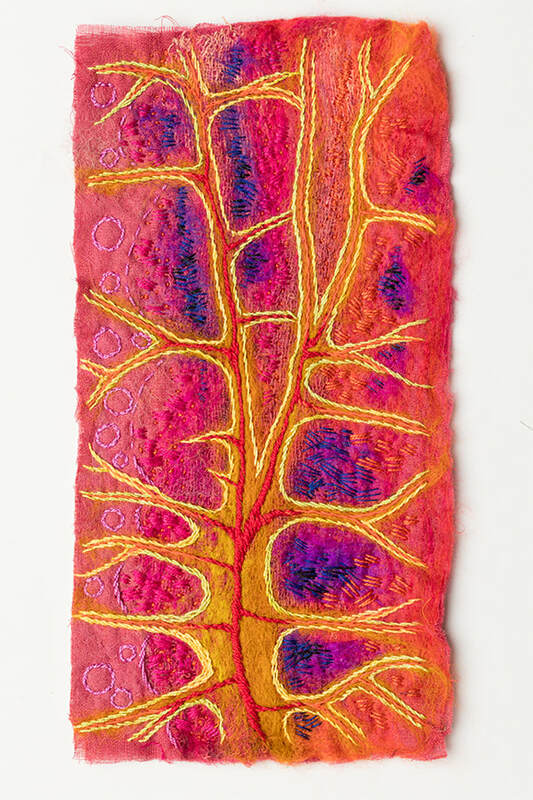 ​The approach in the first part of the book is to look at the naturally occurring patterns in nature, explore where they are found, what their characteristics are and show how those patterns can be translated into stitch. It is helpful to see several different interpretations for each pattern using a variety of techniques. These may range from densely hand-stitched samples of concentric circles to dimensional frameworks dipped in paper pulp and stitched. Such a wide variety of examples draw not only from the author’s beautifully executed work but also draws on the experience of other notable textile artists. ​The focus of the book is on the author guiding the reader on how to develop their own interpretations and to that end, each sample’s process is explained. Starting with small ideas, leading to in-depth research and building up a plan of translating into stitch will provide a process for work of this nature. It is methodical and practical and is aimed to avoid being overwhelmed by an unfamiliar process. The use of Jean Draper’s annotated sketches, examples of experiments with pattern arrangements and the origins of line, symbols and patterns all contribute towards a more coherent foundation of knowledge in this area. Examples of works from around the world show us how culturally, approaches can differ. This is a design book not exclusively for textile artists but for anyone with an interest in the origins of pattern and its place in design. If you enjoy this book, look also at Jean Draper's previous book, published by Batsford, Stitch and Structure. If you like Jean Draper's work, see also work by Double Trouble (Jan Beaney and Jean Littlejohn) and Pauline Verrinder. Jessica Jane Pile is the Production Director of Hand & Lock, an embroidery atelier based in London which specialises in work for The Military, The Royal Family, Ecclesiastical and European fashion houses. She is in a perfect position to tutor the reader on fine detail embroidery and for those who wait eagerly for the new embroidered garments that Fashion Week unveils, then this book is for you. It’s what everyone who wants to push their embroidery skills and aim for the heights of Haute Couture should be reading. The book would be most useful for aspiring fashion embroiderers. It provides the tools to get you started and provides examples of work by Hand & Lock and couture designers (such as Alexander McQueen, Oscar de le Renta and Elie Saab) to demonstrate how embroidery in couture pieces have been constructed. The book explores the difference between hand and machine embroidery, how these are achieved in fashion embroidery and how knowing this will enable you decide what embroidery is best for you. There are instructions on what materials you need to get started and how to set up a frame properly with the correct tension, how to develop and transfer a pattern and the basic hand embroidery stitches which form the basis of couture embroidery. There are not a huge number of stitches and the emphasis here is on getting the practice and using skill and imagination to produce innovative and eye-catching work. Once the basics are covered, more options are explored with silk shading, tambour beading and goldwork (for which Hand & Lock are most famous for). 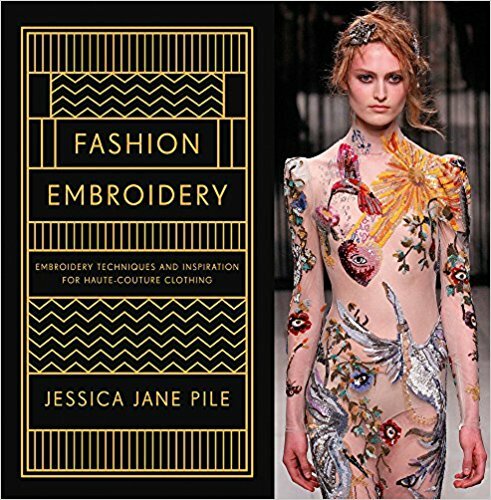 This is a wonderful book, beautifully illustrated with close-up photographs of couture embroidery. The author shares her expertise to explain how the featured work is constructed and gives the reader the sense that given some imagination and a working knowledge of the best techniques you can achieve anything. The Haute Couture embroidery included in the book shows you what you can aspire to. The instructions given are clear and practical and it is good to see a book that doesn’t treat fashion embroidery as a secret club that the select few are invited to join. If you are working on foundations of good technique and preparation, which are described in the book, then you are in the best position to start creating something fit for the catwalk. 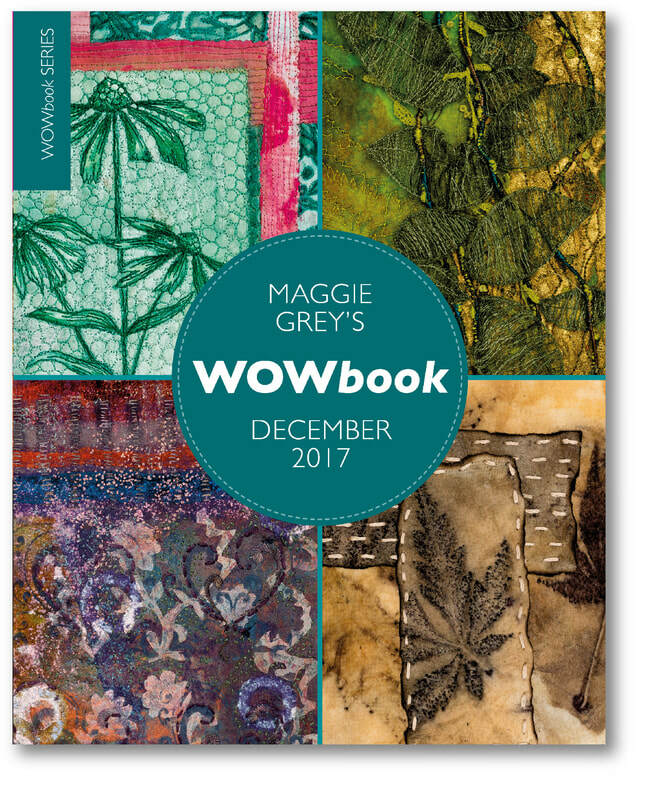 Hotly anticipated since its publication was announced, Maggie Grey’s WOWbook is now available to buy. It replaces the format of Workshop on the Web, Maggie’s online textile magazine, which has run since 2001. The new book retains the essence of WOW with tutorials from leading textile artists, an interview with the Gods of Textiles, Jan Beaney and Jean Littlejohn (below) and Product reviews, now incarnated as ‘Hero’ Products which give you an in-depth review of specific items (this time water-soluble fabrics). For those people who love to hold a book, it’s a great opportunity to peer closely at Michael Wicks’ stunning photography and there is more of a feature made of the contributing artists, including a page for each to introduce them and their work. ​The strength of the book is the focus on tutorials by the artists. It takes a personal approach with them talking about their work and inspiration as well as the process of how they create. The artists demystify their often simple processes which combine to produce wonderfully complex work. Hilary Beattie, always a favourite, is teaching the process of making your own fabric for a hanging. Hilary’s voice is like a warm hug, there to reassure you in your choices and guiding you all the way. 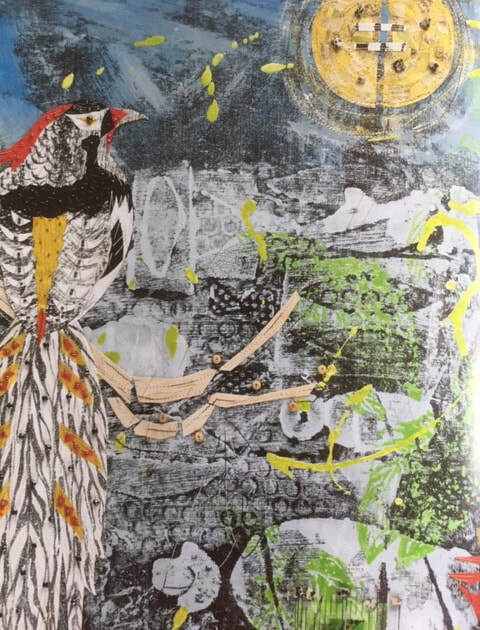 Caroline Bell’s exquisite eco-printing and lamination creates spectacular end results. Laura Edgar talks about her colour palette, inspiration and how she tackles each stage of work to create her atmospheric landscapes. Maggie Grey’s vessel has a bit of everything – step by steps for more involved techniques and ways of taking the process further. 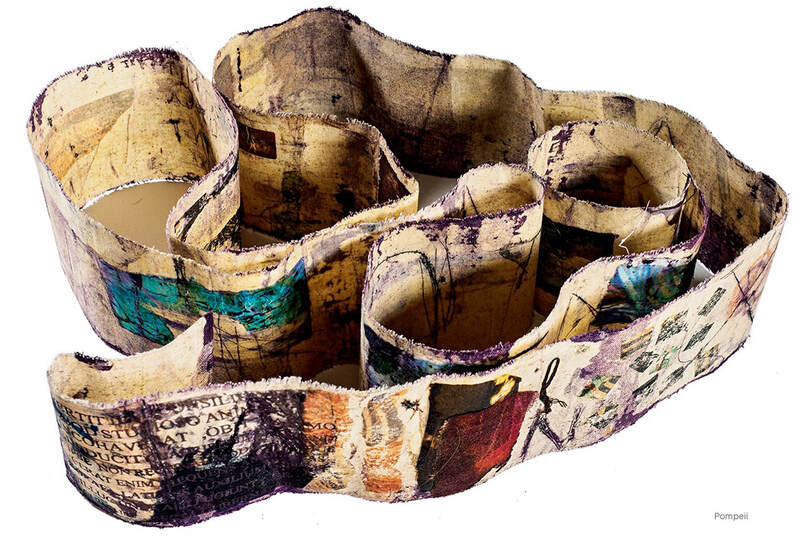 Angie Hughes’ work is compelling and she creates a rich, textured organic piece building on several techniques that are melded together and reveal hidden treasures the closer you look. All wonderful. I’m slightly biased about the interview with Jan Beaney and Jean Littlejohn as it was one I did myself. Having done interviews for WoW for several years, this was one of the most interesting (and daunting) as there isn’t anyone in the textile world who hasn’t heard of them. 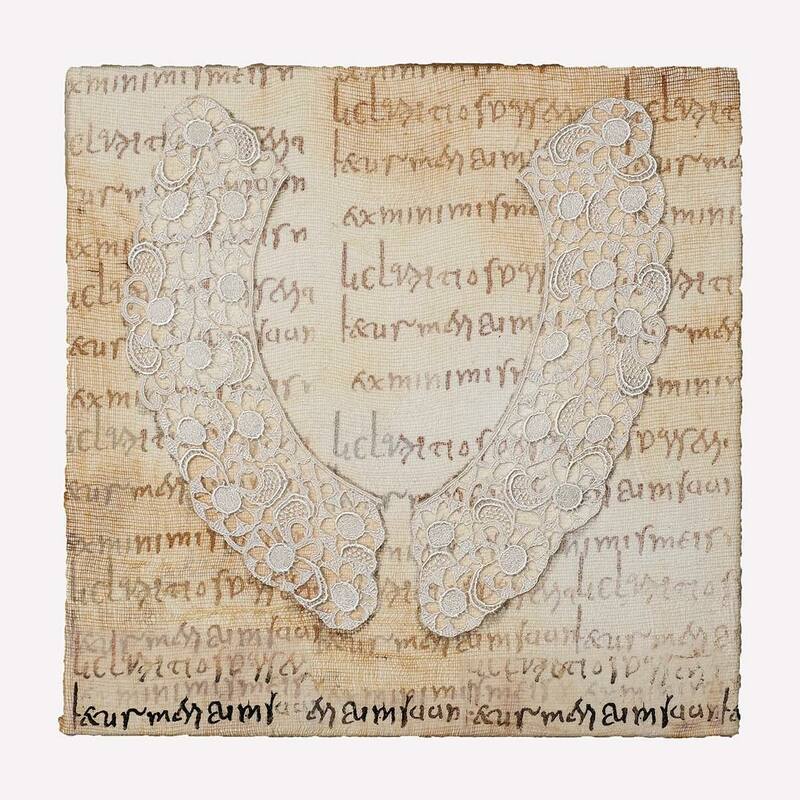 They talk about their past, present and future work as well as their work as Joint Presidents of the Embroiderers’ Guild in the UK. Stalwarts of Workshop on the Web won’t be disappointed by the new look of WoW. The articles are less structured in the book but this suits the approach of the artists to their work and allows a more personal element to join the fray. We hear more about what motivates them to create and how they go about it, which for those always intrigued by the processes and thinking behind creative souls, is a great bonus. There is more content online for those that have bought the book and so it sets to be a very inspirational venture for the WoWbook team. Els van Baarle and Cherilyn Martin have an artistic relationship going back over two decades and have worked collaboratively during that time. 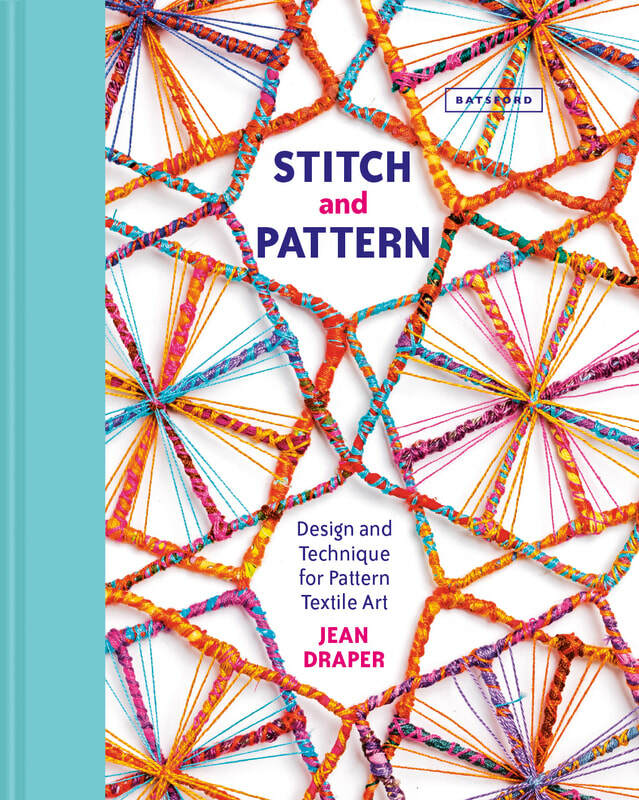 In this new book, they have come together to look at how to approach textile work whilst following a theme and how one theme can be developed differently depending on your own techniques and style. 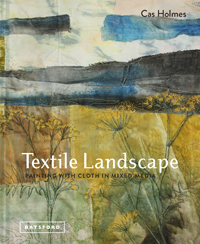 The book offers practical advice to the textile artist about ways of working to achieve an end goal and showcases some spectacular and thought-provoking finished pieces. What binds these two artists together is their interest in common themes: the past, passage of time, ancient cultures and marks left by Man. These themes lead to the creation of each artist’s individual work but with a cohesive quality that allows them to sit together comfortably. Their paths cross over when looking at how to delve further into the development of a piece of work. 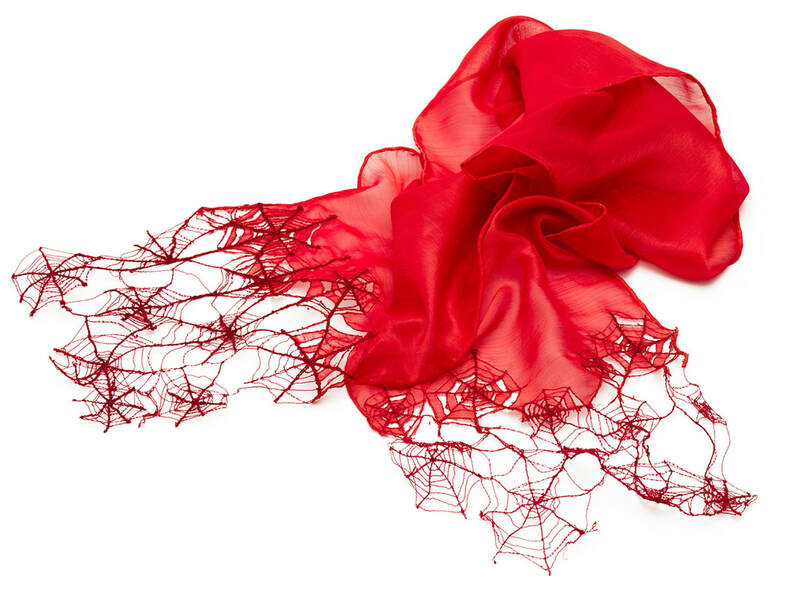 Materials used include fabric, paper, wax, paint and thread and uses dyeing, screenprinting, lamination and layering. The raw materials may be similar but each artist’s work is individual. ​To start developing any work from a theme, there is first a chapter on the creative process, which sets out the phases of a creative process (inspiration, gestation, fruition and assessment). These neatly set out how having the right planning and consideration into how a piece of work will evolve can make the process easier and gives stages of development to follow. A comprehensive look at elements of design, colour, proportion and balance also gives some foundation for a practical approach to a new piece. The main body of the book deals with several themes which cover the artists’ shared interests. There are works based on graveyard stones and inscriptions, walls and their markings, Pompeii, the past, book forms and using everyday objects. Each chapter delves more deeply into the many interpretations that each theme throws up and how a particular focus can be followed. Each artist’s own interpretation is explained but there are also suggestions on how the reader could develop their own approach. By being able to follow their process of work and how each stage builds on the last, a clearer picture emerges of how a considered and thoughtful approach can provide the building blocks for a balanced end result. There are some wonderful finished pieces included from each artist. Cherilyn Martin’s Pillow Books, a series of Vintage dress collars mounted on screen-printed cotton (below); Els van Baarle’s Letters from a Friend (above), a series of works developed from the envelopes kept by her friend Henk and made into wonderful cascades of colour. Both have created some beautiful book forms which are a highlight. The book ends with suggestions on how to see (perceive) what surrounds us with a view to finding more magic in the everyday. By tapping into this, we are more likely to add fuel to our imagination and be more receptive to our creative development. Photography reproduced through Batsford Books; photography by Joop van Houdt. 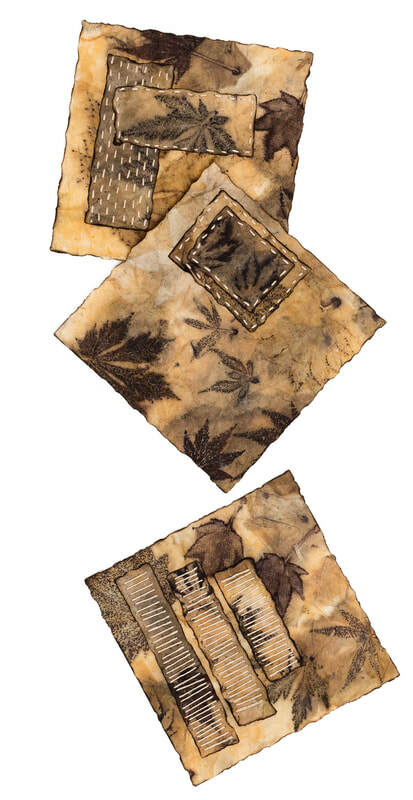 The book develops an idea that was first raised in Cas’s book The Found Object in Textile Art and looks more closely at how the world around you can be a starting point to develop your creative ideas. By making a connection to people or places, it becomes a way in to building a narrative using stitch. Each chapter that follows looks at aspects of recording information, how inspiration can be seized upon, albeit from the everyday surroundings or from your travels, adding detail to your work and telling a story. Dealing with ways of recording your travels or observations is addressed early on. 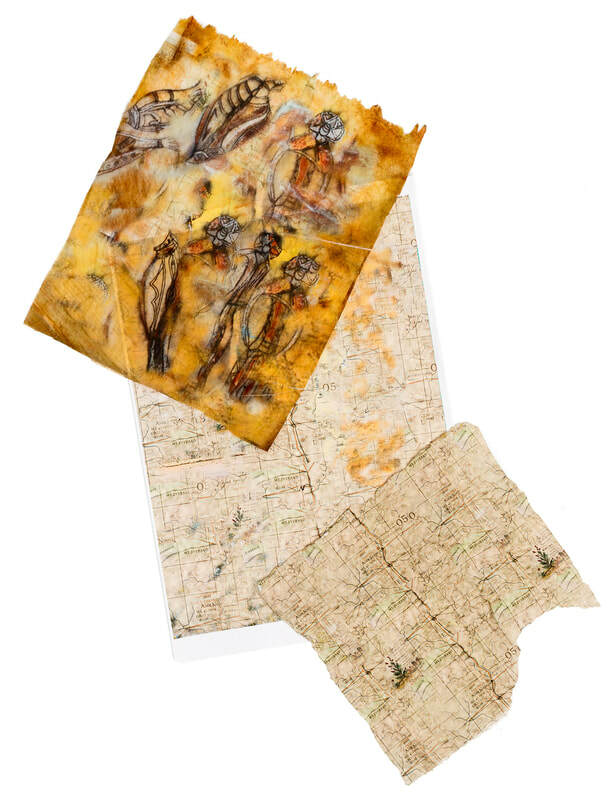 We are given a wide view of the benefits of gathering information by journal, sketching, stitching, recording with digital media and mark-making. There are checklists and suggestions of how you could approach making these observations. 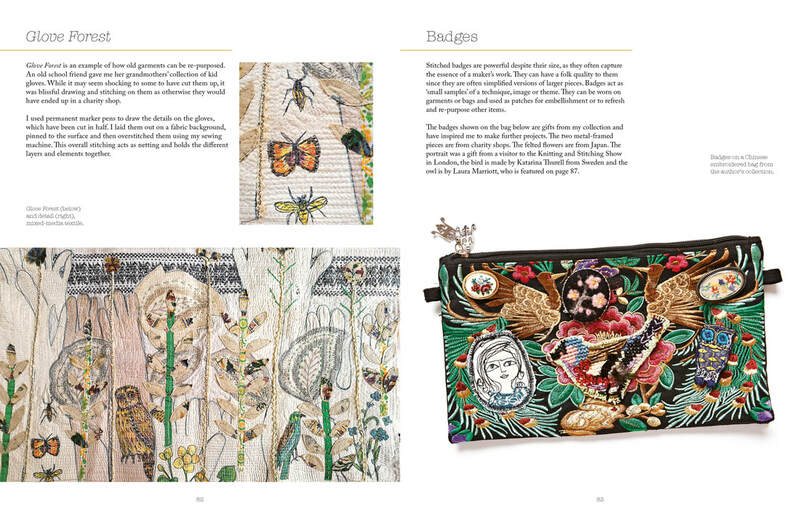 The book is all about finding inspiration and translating your experiences into textile art. 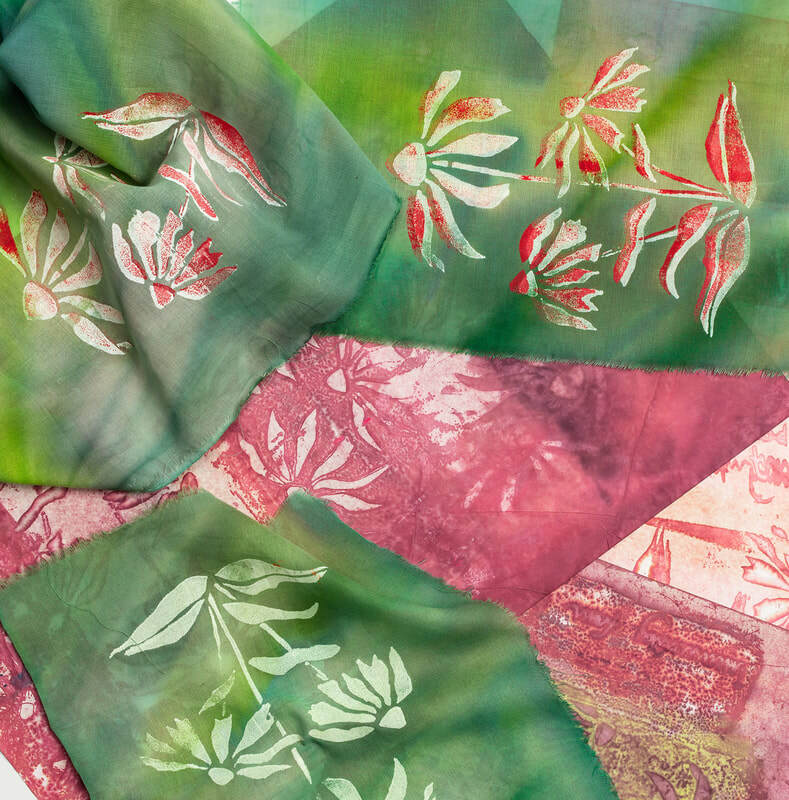 There are some exercises and mini-workshops to do which provide a wide range of techniques to try out, including wet appliqué, low-water immersion dyeing, monoprinting, transfer paints and printing. All are presented with photos from Cas’s work, which mean there is a huge amount of fabulous surfaces that you will most likely gain a lot of inspiration from. 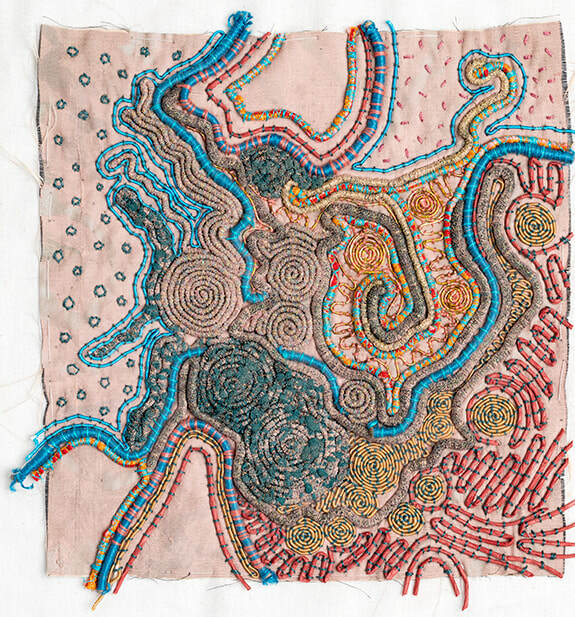 The exercises and tutorials are cocooned within a much broader exploration of what it is to create textile art that is meaningful to you, your community and the world. 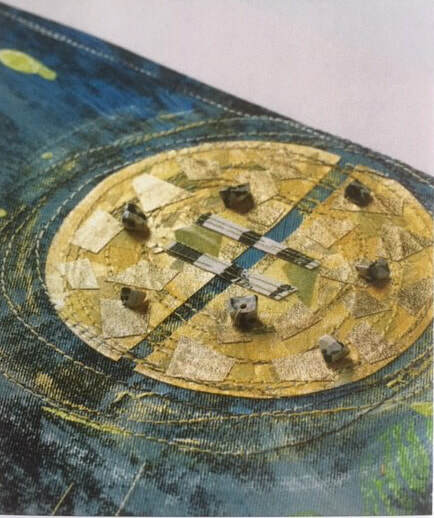 The book is infused with the ideas and thoughts of a group of textile artists, all of whom have a connection to people, places or objects and who communicate their feelings through their art. They range from a view of the world the artist sees (Anne Kelly, Noriko Endo), an affinity to the environment that develops into work over a period of time (Holly Story), recycling and upcycling (Peta Lloyd) or social activism (Mary Fisher). These are only a handful of the artists featured, and all the work is beautifully selected. 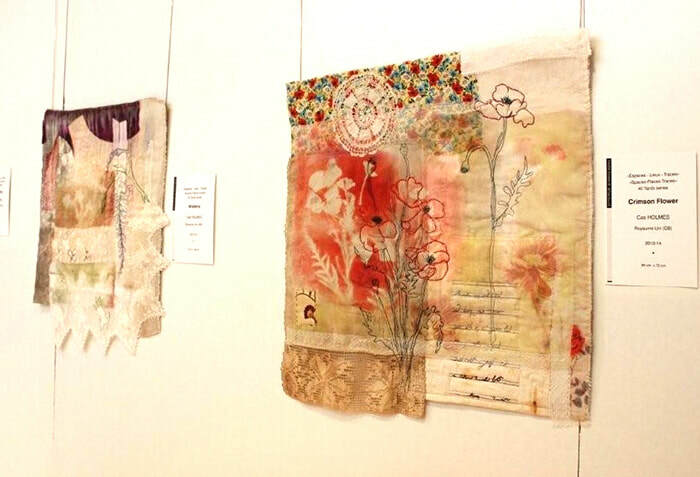 The artists all have something valid and thought-provoking to say about the essence of textile art. The subject is treated subjectively, giving thoughts and suggestions of how to start a journey of discovery by showing you the motivations and considerations of textile artists around the world in order to create a world of art in which you can find your place. It is a highly absorbing read, and I don’t think you will even break the surface after one read. This book review can be found in the March 2015 issue of Workshop on the Web. This book is coming out at just the right time for the reader to sit in their garden during a lovely summer and savour the delights that it has to offer. 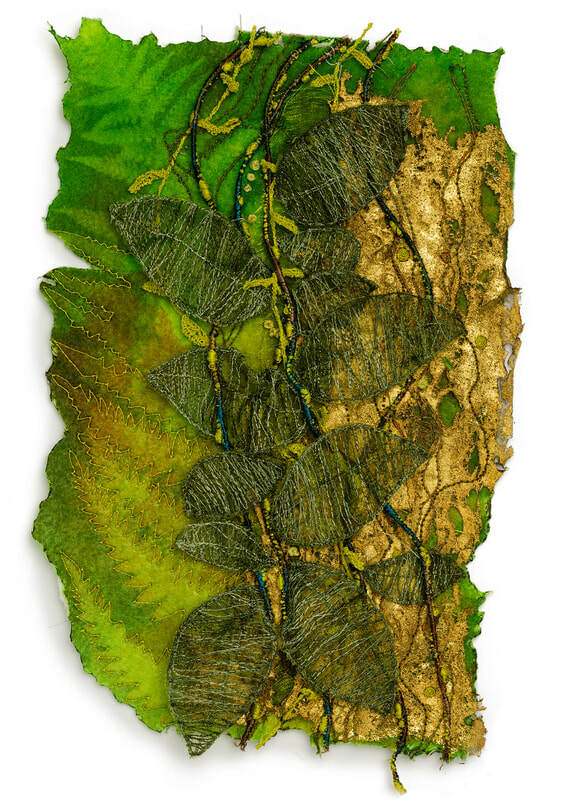 Anne Kelly produces such beautiful work inspired by nature and she has gathered together work that details the prolific relationship between this world and textile artists. It is a workbook on how to approach nature art and uses many examples from her own work and a whole host of local, national and international artists to illustrate. The preponderance of local artists ties in very well with the idea of connecting to both the natural world and local community. 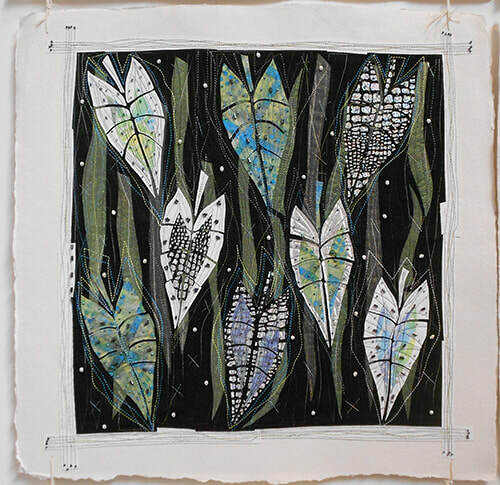 There are well-known textile artists such as Lindsay Taylor, Pauline Verrinder, Alice Fox, Kim Thittichai and Lesley Patterson-Marx with those who work predominantly in paper, such as Jennifer Collier and Louise Petiffer. It explores how all these artists work and guides the reader on how to do the same, whether by creating your own ‘nature table’, making larger scale pieces so you are forced to look more closely at the finer detail or sampling through stitch. My particular favourite section was Taking Flight which looked at the use of birds and insects as motifs. This is one of the most beautiful books to come out this year and is definitely worth delving into. We get to see a huge amount of beautiful and varied work by the many artists involved but it has the vision of Anne Kelly guiding us through the subject matter that makes this a must-have.